Fraser Cain: We’re moving along in the x-ray spectrum. If you’ve ever broken a bone x-rays are a part of the electromagnetic spectrum that you’ve experienced personally. Doctors use x-rays to study the human body but astronomers use x-rays to study some of the hottest most energetic places in the universe. So, let’s put on our x-ray specs and see what we can see. Alright so landscape time I think we were down to 7 nanometers for ultraviolet astronomy. We’ve gone from meters in the radio all the way down to 7 nanometers. Where do we find x-rays? Dr. Pamela Gay: This is where we actually get into people debating because there are those out there who argue that the ultraviolet goes down as short as 7 nanometers. Then there are those that say that x-rays go as long as 10 nanometers. Somewhere between 10 and 7 nanometers is where the x-rays pick up. Fraser: How can that even be an argument? Pamela: Different people decide they’re going to look in different books and get different definitions. Some people like to round things to the nearest 10th because it is convenient. It’s just light that we can’t see. So there is really no clean reason to define it any particular way. Fraser: Is there like some kind of physical characteristic that divides the line between ultraviolet and x-ray? Fraser: Okay, and how small does it get? Pamela: It gets pretty short. With x-rays we’re also looking at things that get down to about a hundredth of a nanometer. So we go from roughly 10 nanometers down to 0.01 nanometers. Fraser: What are those, picometers? Pamela: Well it’s not quite a picometers. It is actually ten picometers. We’re starting to get down to the point where without thinking really hard most of us don’t know what are the correct abbreviations we should be using. It’s just small. This is where we’re starting to get down into really high energies. These things when they hit you, if they happen to hit a piece of DNA quite happily destroy it. Pamela: Yeah it’s one of the kinds of frustrating pieces with the really hard x-rays is they carry enough energy that they can start to blow things apart. It is cool but dangerous. Luckily most of the x-rays we deal with day to day in real life are the softer ones that are a lot less harmful. You don’t want to get a lot of them but getting a dental x-ray, getting a leg x-ray now and then is not going to kill you. Fraser: Those are soft x-rays. Those are the larger wavelengths? Pamela: The larger wavelengths in the lower energies. Fraser: The lower energies and then the harder x-rays are the shorter wavelengths and the higher energies. Fraser: Then I guess we’ve got a little protection from x-rays though living here on the surface of the Earth? Pamela: This is actually one of the really good things. We know that x-rays can go through air. Otherwise you’d have a lot of problems in the hospital because the x-rays wouldn’t make it from the machine to your leg. X-rays in general can only travel a couple of meters through air before they get absorbed. While x-rays start to enter our atmosphere they don’t make it very far before all of their energy is absorbed into the atmosphere. So we’re actually kept safe from all the background of x-ray that exists out there in outer space. Fraser: Then x-ray astronomy from the surface of the Earth completely worthless. Pamela: Yeah it’s just not going to happen. Fraser: It’s not going to happen and you might as well be looking at nothing, it’s completely black. Pamela: But balloons work and that’s kind of cool. Fraser: Let’s talk a bit about again the detectors and the equipment. In my experience with dental x-rays is there some great big kind of gun like thing [Laughter] stuck next to my mouth and then I have to chew on this film in my mouth. Then I hear this bzzzt for a second and then I spit out the little pieces of film and the dentist runs away and comes back and shows me my teeth. Clearly we’ve got an x-ray source and maybe my dentist would replace that with I don’t know a black hole. Then we’ve got a detector [Laughter] which in this case is the film. How does that compare with what astronomers are doing? Pamela: Clearly we don’t have friendly little dental hygienists running back and forth from the Chandra X-Ray Observatory with film to develop in that back mysterious room of your dentist’s office. Fraser: Right but I mean with visible and even with ultraviolet we’ve got a big dish, right? We’re using the same kind of equipment, the same kind of set up? Pamela: No here x-rays are annoyingly difficult to try and focus. They would much rather get absorbed or go through the side of your telescope than to get focused down in a nice friendly way onto a detector. What we have to basically do is cause them to very carefully through grazing angles get bounced onto a detector. We can’t focus them the way that you can focus a nice normal ray of optical light or even infrared light. Take a big round thing in outer space and line the inside of it with shelves of aluminum foil. They don’t actually use like cooking aluminum foil. Line the inside with foil such that if something was trying to come in at an almost parallel line to the foil it would just barely hit it at a grazing angle and get reflected off. If it hits enough of these pieces of foil at the slight grazing angle we can actually very carefully and very slightly bend the x-ray light. We can’t bend it enough to get it into a nice clean focus. When we try and take images of x-rays what they actually do is rely on shadows. This is kind of weird to think about. They actually have these really complicated plates in many x-ray detectors that have a series of holes in them. The x-rays are able to go through the holes and then get blocked by other parts of this plate. They are able to reconstruct the image by where they do and don’t see light. If you have light coming in from the left you’ll get one set of shadows. If you have light coming in from the right you’ll get a different set of shadows. By looking at the shadows and the light they can figure out yes there was light from the left; yes there was light from the right and it was brighter. It is a lot of complicated math to get an image but these images allow us to take an entirely new view on the universe and they’re some of the most spectacular ones that we have. If you’ve never gone out and looked at what supernova remnants for instance look like in x-ray the Chandra Space Telescope has an amazing galaxy. My favorite is this object called 1572 that looks like there is a forest growing out of basically a purple jellyfish. Fraser: Right and of course these aren’t the true colors. They are coming up on computer and they are associating one kind of color let’s say with hard x-rays and another kind of color with the softer x-rays or different temperatures and trying to recreate what’s going on. Of course you couldn’t actually see this with your eyeballs. That’s the way Chandra works? If you look at Chandra it is long and skinny and kind of looks like a space telescope. Pamela: It’s actually got these grazing angles, these foils that very carefully deflect the light just slightly to get it down to the detector. We have detectors that are essentially able to detect each and every single photon that hits the detector and translate that into a signal. Fraser: I guess with a telescope, with a great big mirror you don’t have to get every single photon you just have to get a lot of them but you can focus a lot of them in to concentrate it. In the case of an x-ray one, it’s very hard to get all of the photons. You’re not going to get much more photons than the size of your detector itself. As you said it can narrow a few down but that’s it. Every photon that hits is hitting with such high energy that they’re probably easier to catch in terms of the detector. It is easier to detect a photon that hits with x-ray energy as opposed to say a photon that hits with I don’t know, visible light energy, radio wave [Laughter] right? Pamela: With the optical telescope all of the star’s light that’s hitting the mirror gets focused down to a very few pixels on the CCD detector. Whereas with x-ray telescopes we have those photons going through and then we’re purposely blocking some of them. The ones that do hit the detector are scattered all over the place. We have to catch each and every single one of those. We’re able to do that with things like micro-calorimeters and with Teslas. We’re able to finally after a lot of originally all we could say was yes there’s an object – no there’s no object. We’re finally able to build amazing images of objects using x-ray light. Fraser: I know that Chandra for example does very, very long exposures. They’ll point Chandra at a galaxy cluster or a black hole for a very long time to build up these it’s almost like you can think of it as like drops of rain falling – photon, photon, photon – and then it just builds up the image over time. Pamela: It’s not a fast process. One of the things that really amazes me about this is each of these photons is so much more powerful. While it may take longer to build up a few hundred of them those few hundred if you focused all of them on to one happy little amoeba that would normally be bathing in sunlight on slide, you would toast the poor innocent amoeba. You’re carrying huge amounts of energies in each and every one of these photons. Fraser: Another interesting thing is that they leave Chandra sometimes open can actually get science done just by the in-betweens. Chandra is moving from one location to another location and they’ll still record everything it sees as it is sloughing to a new spot. Astronomers have made use of all of that in-between data as well. It’s pretty cool. Pamela: One of the cool things that we’re finding and Chandra is not solely responsible for this but the entire sky glows in the x-ray. There’s this diffuse background of x-ray radiation just like there’s a diffused flow of microwave radiation. But we know where the microwave comes from and we’re still trying to figure out where all this x-ray radiation is coming from. Fraser: Are there any theories? Pamela: Lots but we don’t know for certain. For instance we know early in the universe there was wild star formation. There were lots of quasars and lots of active galaxies. It could just be that all of those added up might, maybe but it is a lot of energy to come up with. We’re still trying to sort this one out. Fraser: Right it would have to be red shifted as well because it would be so far away. Pamela: If you start off in the gamma ray you can land yourself happily in the x-ray. Fraser: Right but that just means that yeah there’s some really – and I guess gamma rays that’s next week. What kinds of things – we’ve kind of hinted at it – what kinds of things are we going to want to look at and study in the x-ray? Pamela: One of the coolest things to actually look at in the x-ray is our own moon. Pamela: It’s not exactly that our moon itself is radiating away x-rays but our sun does give off x-rays. At least it normally does, right now much to the annoyance of every lunar scientist it’s adamantly not having any sunspots and not having any coronal mass ejections with their associated x-rays. When you have a normal active moon when a blast of x-ray radiation from the sun hits the moon it can interact with different minerals and fluoresce. Anytime you see a mineral fluoresce this is for instance what you get when you shine ultraviolet light on a white shirt, when you shine ultraviolet light onto a rock that contains fluoride. The high energy light gets absorbed. Some of the energy makes the molecule vibrate madly. Then some of that light gets re-radiated with a longer wavelength and we can see it. With the x-ray fluorescence some of these high energy particles has some of this high energy light gets absorbed by the minerals on the moon and then re-emitted as softer x-rays. We can actually see the glowing x-ray moon against a background of much, much fainter x-ray emission from the whole universe. Then on the dark side of the moon – the side of the moon that’s not getting lit up with the sunlight – you see darkness. You can end up with these really neat images of bright x-ray fluorescence from the moon background x-rays and then the dark part of the moon just sitting there going I’m dark. Fraser: Right because it’s not getting any light from the sun. Okay, the moon, what else, the sun? Pamela: The sun and here it’s not that our sun is hot enough to just haphazardly be emitting in the x-rays. X-ray corresponds to temperatures far greater than our sun. When you take a magnetic field line and rearrange it, this is what happens when we get coronal mass ejections. There is a huge amount of energy in the magnetic field lines. When you release all of that energy into space some of it gets released in the form of x-ray. Some of it gets released in the form of high velocity particles. It’s those x-rays from the sun that we see getting reflected off of the moon. Those are all pretty cool, they are all pretty nearby and pretty easy to observe. The easiest thing to observe is actually the center of our galaxy. When you look toward the center of the Milky Way you see a large bright x-ray source. This is actually just background from our own black hole flickering away in the center of the Milky Way. Fraser: I know that the center of the Milky Way is blocked by gas and dust. In the visible light and ultraviolet we can see it in the infrared. We are able to see it in x-rays? Pamela: We’re able to see it in x-rays as well. Fraser: Isn’t that kind of amazing? X-rays are blocked by a few meters of our atmosphere and yet they can pierce the shrouds of gas and dust from the center of the Milky Way. That’s quite amazing. Pamela: That itself still isn’t one of the brightest sources. That’s just sitting there flickering periodically giving off x-ray light. The brightest things of all are things that we have to randomly go searching for. These are x-ray binary systems. This is where you take a couple of high mass objects put them in orbit around one another and let one of them steal mass off of the other. The brightest x-ray source known for a long time was Scorpius X-1. It is an object about 9,000 light years away. It gives off more light in just the x-ray than the sun gives off in all of its wavelengths combined. In the system we have what we think is just a nice happy normal neutron star orbiting another star and sucking material out of its atmosphere. As that material spirals in it radiates away energy because it is going really fast. In order to slow down and orbit correctly it has to radiate some of that kinetic energy away as thermal energy. That energy is getting radiated away in the x-ray. Fraser: If you could actually see the object, what would it look like? Would it be sort of like have an ecretion disc around it and then be the neutron star spinning at the middle? Pamela: It is sufficiently far away that it is just a boring point source. It is just this blob of x-ray emission. Fraser: Of course but if we could get close and see? Pamela: If we were able to get close and see we’d probably see bright x-rays coming from the ecretion disc itself and then also perhaps flickering at the point where material is getting torn off and were perhaps interfering with the magnetic field of the companion star. You’d also see bright x-rays associated with the magnetic field of the neutron star itself. I have to admit I don’t know enough about the details of these systems to know what would be brightest, what would be faintest but you would have a lot of different places would be giving off x-ray emissions at varying amounts. Fraser: Do the x-rays come off in jets or the just kind of come off in all directions equally? Pamela: With this, it is actually thermal radiation. The same way you get thermal radiation from a hot rock. Pamela: It is all directions. Fraser: There are objects out there that do give off jets that can be seen in the x-ray. Pamela: This is one of the cool things. It’s not actually the jets that are doing the x-ray emitting. It is the way they shock the material around them that leads to the x-rays. One of the really cool things that happens when you start looking at giant active galaxies especially when they’re in clusters of galaxies is you have jets that are emitting in the radio predominantly. These are electrons flying through space spiraling around magnetic field lines. As they spiral they’re giving off light in the radio. As these accelerated particles that are accelerated by the magnetic field associated with an ecretion disc in an active black hole get accelerated down the jets eventually they start colliding with the interstellar medium, the intergalactic medium depending on if it is a super massive black hole in a galaxy. You can also get this with stellar mass black holes. In either case these jets end up hitting the gas and dust that pretty much is everywhere in space. Space is full of gas and dust. As it decelerates against this gas and dust it shocks that gas and dust. It is the shocking, the sudden deceleration that ends up leading to the x-ray emission. Fraser: Wow. You’re getting these kinds of spots of very high temperature. I know that some of the greatest pictures taken by Chandra are these gigantic galaxy clusters colliding together with gas clouds of millions of degrees just because of all of the energies involved. One of the questions that I have is how can you have these gigantic gas clouds of millions of degrees, are we getting stars there? Pamela: The amazing thing about these clouds is well as astronomers refer to them as dense they’re not dense and their high temperature doesn’t come from the high pressure or lots of collisions taking place. They’re actually such a high temperature because you have the particles, the atoms getting accelerated into these giant massive, massive objects. When they do occasionally collide they’ve been accelerated by gravity. When they collide they radiate away all of that kinetic energy in the form of x-ray emission. In this case it is the velocity is equivalent to the temperature. You end up with this really high temperature because you have a lot of gravity. Fraser: Oh, and we’re seeing the collisions. Pamela: We’re seeing the collisions. You don’t have to have a lot of them to have a lot of the x-rays. Fraser: You wouldn’t even notice. Pamela: You’re like vacuum of space, I’m fine not a big deal. Fraser: Yeah, million degree gas? That’s not so bad. What else would we want to look at with x-rays? 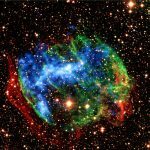 Pamela: The coolest objects of all of course are supernova remnants. This is the case where you have an exploded star. It’s not the whole exploding part that gives off the really cool x-rays although you do get cool x-rays with the explosion part as well. The really cool stuff comes when the shed atmosphere of the supernova, when the part of the star that gets flung out into space starts hitting the gas and dust that’s between the stars it rapidly decelerates. In the process it can give off just the most amazing x-ray emission. Here you can end up with all sorts of wonderful structures. We don’t know what causes all of the structures. In many cases it is just well that’s the shape the gas and dust was in and when you shocked it and it ended up with this new shape. It’s kind of like what happens when you blow on a really dusty bookshelf. You get a clear space and then how the dust around the clear space is shaped depends on how long it has been since you cleaned your shelf, how much friction there is, all sorts of stuff. Trying to sort out supernova remnant is sort of like trying to sort out the structure of the clean spot on the shelf you’ve just blown on. It is hard and we’re not entirely sure what all is there to take into consideration yet. A planet can get in the way. Asteroid belts can get in the way. All of these things can affect the final shape of a supernova remnant. Fraser: What do you think are some of the big questions out there – and I guess you alluded to one of them – that would be answered by x-ray astronomy? What I’m mentioning is what this background x-ray radiation that we see everywhere is? Pamela: One of the coolest things that we can do with x-rays is we can trace out how is it that galaxies go through their life cycle. How is it that when they’re young they’re rich in star formation and have active galactic nuclei? How often do these super massive black holes go through feeding phases? As we look back to further and further in the past we’re able to see galaxies at all of their different stages of life. We’re able to see ah; when we look here there are a lot of quasars. When we look here there aren’t but now we see spirals merging together and their central super massive black holes turning back on. We can see this turning on and turning off of the super massive black holes in the form of basically the x-rays they split out while they’re in the process of feeding. We can study how is it that we get to this wonderful galaxy that we live in and we get to the diversity of galaxies all around us over the course of the universe’s evolution. Fraser: That’s one of the big questions that I guess with the launch of the James Webb telescope and some of the other observatories coming out. We’re probably going to get a pretty good answer to within the next couple of decades which is how did we get from the big bang and just a spray of hydrogen and helium to smaller galaxies, to bigger galaxies, to the big grand spirals that we have today. What’s the process? Did they all come together quickly? Did they come together in bits and pieces? I think that’s one of the questions that I see as I work on articles that keep coming up again and again. Astronomers just don’t really know the exact process. Obviously they have some ideas. The x-ray is just another tool in the toolkit to do that. Pamela: It is a long journey and we have many more telescopes to go before it is done. Fraser: Well I think that wraps up x-rays for this week. I think we’ve only got one left. Pamela: I think we have gamma rays another one of those that doesn’t have an edge. It and the radio define the two ends of the spectrum. Fraser: Next week we learn how to make The Hulk. Supernova remnant W49B, seen in X-rays and visible light. I’ve never broken a bone, X-rays are not part of the EM spectrum. Dark side of the Moon???? X-rays not part of EM? Joe, listen to what Fraser says in the beginning of the podcast, then read what John wrote. You should see the joke he was making then lol! It was just my light-hearted way of commenting on the show description, which has since been changed. It had read, “If you’ve ever broken a bone, X-rays are part of the EM spectrum”, which seemed funny to me. Jordan got it. Sticks, when the far side of the moon was first named the dark side, it was using the meaning of the word dark that means it is unknown. I can tell Pamela realized right away that she had used the term in a potentially confusing way because she clarifies that she meant the side that is not illuminated.